Sarah Allen Benton is a Licensed Mental Health Counselor (LMHC) at a counseling center in Boston, Massachusetts. She is the leader of the Alcohol Skills Training Program directed toward helping college-age problem drinkers and has made a variety of psycho-educational presentations including Mindful Drinking: Moderate Drinking for College Students and The Truth About Ecstasy (club drug). Benton is also a blogger for PsychologyToday.com and is the author of ''Understanding the High-Functioning Alcoholic: Professional Views and Personal Insights. Recently, Ms. Benton took time out of her busy schedule to answer LoveToKnow's questions about this interesting subject. LoveToKnow (LTK): How would you define a high-functioning alcoholic? Sarah Allen Benton (SAB): A high-functioning alcoholic (HFA) is an alcoholic who is able to maintain his or her outside life such as a job, academics, home, family and friendships, all while drinking alcoholically. HFAs have the same disease as the stereotypical "skid-row" alcoholic, but it manifests or progresses differently. Many HFAs are not viewed by society as being alcoholic because they have succeeded and over-achieved throughout their lifetimes. These achievements often lead to an increase in personal denial as well as denial from colleagues and loved ones. HFAs are less apt to feel that they need treatment for their alcoholism and often slide through the cracks of the health care system, both medically and psychologically, because they are not diagnosed. After having one drink, they have trouble controlling their intake. They think obsessively about drinking including when and where and with whom they will drink next. When they drink, they behave in ways that are uncharacteristic of their sober self. They are unable to imagine their life without alcohol. They experience chronic blackouts (memory lapses) from drinking. LTK: Do high-functioning alcoholics fit a specific profile? The ability to function in "survival mode"
LTK: Does the behavior pattern of high-functioning alcoholics run in families? SAB: According to the Surgeon General's 2007 Call to Action report, genetics account for 50 percent of the chances of developing alcoholism. Therefore, alcoholism is passed down in families for generations. In the case of HFAs, the alcoholism may present in a more subtle manner that can include the drinking culture of the family. When parents role model a "work hard, play hard" mentality or use alcohol to relieve the stress of their careers and lives, they are implying that this type of drinking is acceptable for their children. In my book, many HFAs reported that their parents had high expectations for them, and that they began to internalize these high standards for themselves; alcohol frequently became a reward system for them. Some HFAs report that their parents were lower functioning alcoholics and this increased the denial around their own alcoholism. These HFAs would compare their drinking to their parent's alcoholism and never felt that they were alcoholics because they were not "as bad" as their parents. LTK: Do families play a role in high-functioning alcoholic's denial? SAB: The societal stereotype of the typical "skid row" alcoholic feeds the denial of HFAs and their loved ones. HFAs use their external successes to deny that they may be alcoholic based on these societal messages about the alcoholic image. In the mind of HFAs and their loved ones, alcoholics are unemployed, have poor work performance, have poor academic records and are typically homeless. Therefore, the fact that HFAs are functioning well on the outside allows them and their loved ones to deny their alcoholism and feel that they are "better than" an alcoholic. This powerful sense of denial also prevents the loved ones of HFAs from intervening because they may not have concrete evidence that their alcoholism is leading to tangible losses. HFAs may provide the main source of income for a family, and therefore spouses or partners may not feel that they have the leverage to persuade the HFA to get help. LTK: What holds a high-functioning alcoholic back from getting help? SAB: There are many barriers to getting help that HFAs report and that research has indicated. Only 25 percent of all alcoholics ever receive help. Therefore, it is important that these barriers are broken down. The most common is their denial that they need to get help or that they are really alcoholic. Secondary denial from family members is another barrier, in that the family may begin to enable the HFA and feed into their alcoholism. HFAs have also reported sliding through the cracks diagnostically with the mental health and medical fields. Another barrier is that HFAs are often fearful of what others may think about them for admitting that they are alcoholics personally and professionally because of the stigma that exists in our society. Finally, some HFAs report that they have actually attended recovery program meetings (A.A., SMART Recovery® and Women for Sobriety), and they did not feel that they related to the stories that they heard and subsequently stopped attending. It is important that HFAs try to identify with some aspect of the stories that they hear from lower functioning alcoholics instead of comparing themselves out of the meeting. It is also recommended that they try recovery program meetings in different locations in order to get a good "fit" and to stay in a program for at least two months before making a decision. 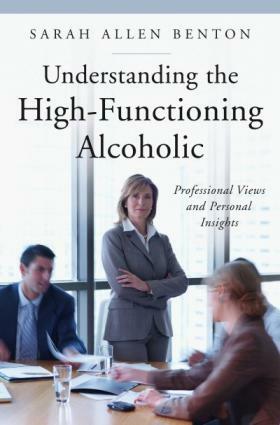 LTK: What advice do you have for someone who is a high-functioning alcoholic or who thinks they might be one? SAB: An easy and effective way for individuals to determine if they are probably alcoholic is to try and control their drinking. For example, they can set a limit on drinking, such as drinking a maximum of two nights per week and only having three drinks in one evening or one drink per hour. Next, they need to objectively determine if they can adhere to these limits. If they cannot, this is really good evidence of being an alcoholic. Typically, an alcoholic cannot adhere to this type of a drinking limit for a long period of time, if at all. Therefore, if an individual has failed at controlling his or her drinking, it is recommended that he or she have some type of evaluation by a therapist (preferably an addiction specialist) or medical professional and then begin developing some type of treatment plan. Treatment plans may include therapy, medication treatment (for underlying mental health issues) and/or attending meetings of abstinence-based recovery programs such as Alcoholics Anonymous, SMART Recovery® or Women for Sobriety. A detox facility is strongly recommended for alcoholics who are physically dependent on alcohol because alcohol withdrawal can be fatal. LTK would like to thank Sarah Allen Benton for sharing her expertise.